One of Egypt's most popular experimental musicians, Maurice Louca, is set to release his second album Benhayyi Al-Baghbaghan (Salute the Parrot) by 17 November through the newly established music label Nawa Recordings. The album is available for free streaming online prior to its official release for a week on Arabic independent music critique site Ma3azef.com. Salute the Parrot features Louca's compositions and revamps of local sounds from the Mahraganat music scene, a genre that blends folkloric Egyptian music and psychedelic and electronic influences. The sound the artist produces is unique to Louca, and gives the listener an entirely new experience with sounds they may have heard before returning as they are drenched in percussion-based rhythms and layers of compositions and improvisations. The album features guest artists such as Mahraganat artist Alaa 50, Mohamed El Mahalawy, Alan Bishop, Tamer Abu Ghazalaeh, among many others. Salute the Parrot's original cover artwork was designed by Egyptian contemporary artist Maha Maamoon. The album will be available for download on iTunes and amazon. Information on the release concert will follow later. Louca's first solo album Garraya was released in January 2011 on Cairo's 100Copies music label. 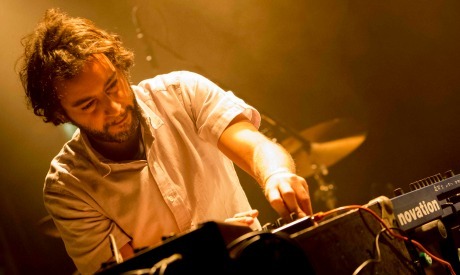 The album received critical acclaim, and since then, Louca has spent his time holding live performances in Egypt and abroad, composing scores for films, video art and theatre. The artist is also involved in a number of musical projects next to his solo work. He is a co-founder and performer in bands such as Bikya, Alif and the Dwarves of East Agouza.